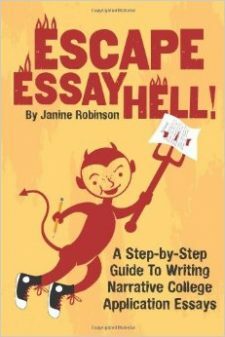 Here are 6 sample essays from Heavenly Essays: 50 College Application Essays That Worked, by Janine Robinson. They are all narrative, slice-of-life essays that used real-life experiences to illustrate points the students wanted to showcase about themselves. Every day after school, the first thing I would do was climb the stairs to my dad’s bedroom and sit on his bed. He would reach out to me and hold my hand while I told him about my day: if I got a good grade on a paper; if a teacher liked one of my comments in class; or if I did two pirouettes instead of one. He would smile and tell me how proud he was. Nothing made me happier—except the hope that I was also making him happy. The reason my dad was there for me almost every day of my life was that he was diagnosed with cancer and homebound since I was an infant. I learned about life from leaning on him and from him leaning on me—especially when my mom abandoned us because she couldn’t handle his illness. I went to him for all of my needs. If I had a problem with a friendship or a relationship, if I was scared of the dark, and especially if I procrastinated on a paper, he would stay up late to help me no matter how sick he felt. In a way, he was my life coach, personal therapist, best friend, and dad all in one. But at the same time, he leaned on me. By the time I was 10, he could no longer eat. My mom stopped cooking. From then on, we no longer gathered around the dinner table. Not only did I have to learn to cook for myself, but to feed my dad through his feeding tube as well. Then during my freshman year when my mom left us, I took over her responsibilities. I did the laundry, cooking, cleaning, and was my dad’s personal nurse. Last year, after I turned 16, he had to go on oxygen 24 hours a day and was bedridden. I learned to pay bills, shop for a month’s worth of groceries without spending more than a hundred dollars, and drove him to his doctor’s and physical therapy appointments. I could not have friends sleep over, stay out late, or bake cinnamon pancakes because the smell bothered him. When we had to put our house on the market, I raced home every day and frantically cleaned it for showings. I never talked to my dad about my own struggles or fears because I did not want to worry him. We were both trying to make each other feel better. My goal each day was to make him smile and relieve his suffering any way possible. But when he left this earth, I felt like my purpose was gone. I was lost. There was no one at home, no one to stay up late and help me with my schoolwork, no one to help me decide what were the right colleges to apply to or what field or major I should consider. Even though my dad leaned on me for everything, I didn’t realize how much I leaned on him until he was gone. Going back to school after he died was the hardest thing, but his passion for education motivated me to resume my classes and get the best grades I could despite my sadness. My dad put me first, and I put him first. Now I am learning how to put myself first. I now have a life coach, practice meditation, keep a daily journal, and have guardians who love and guide me. In meditation, I am learning to have empathy and compassion for my mom, but at the same time respect my own needs first. I still think about my dad all the time, and hear his voice encouraging me with his favorite saying: “It is better to be kind than right.” I think my dad would be more proud not only that I am pursuing my college dreams, but that I am learning to take care of myself like he always took care of me. ANALYSIS: This essay nearly broke my heart. And I know it was very challenging for Alex to condense her story to under a mere 650 words. At first, I tried to encourage her to find a different topic, since her dad had only passed away months earlier and she was still grieving. But it became clear that she had to write about this. Nothing else was so defining in her life; nothing even came close. The challenge of writing about such a traumatic experience was to keep the main point about herself. The objective of a college app essay is to reveal your unique qualities and character, and not just tell a poignant story, especially about someone else. Alex did a great job of relaying what happened to her dad and herself so we felt the impact, but mainly focusing on how it affected her. She gave the essay a sharp focus by extracting one part of their complicated relationship—how they each supported the other—and starting the piece with a moving example (anecdote) of how that worked. Also, despite the tragedy of his death, Alex did not allow the reader to feel sorry for her, and kept the message positive and hopeful—just like she is. After two hours of intense racing on the open water, we thought our day was done. Instead, our coach ordered us to race another five miles home, rowing as hard as when we came. Stuck in the middle of the harbor with seven other teammates in the crew boat, there was nowhere to hide. “Give me a reason to call 911,” coach yelled. Drained and exhausted, I could feel my eyes starting to close. Tunnel vision set in. For a few moments, I blacked out. I had been here before. This was the point where I had to push my body to do the opposite of what my brain wanted me to do: Go even harder. I focused on the coxswain yelling at me, and hoped my adrenaline wouldn’t wear off. When I first joined the team as a freshman, I only knew a little about this sport. My older brother warned me about the ridiculous hours and tough workouts. The one thing no one told me, though, is that to row crew you had to be a little crazy. It’s not the mentally insane type of crazy, but the type where you force yourself to disregard all logic and reason and push yourself to keep going. After four years of rowing crew, I realized that this was exactly what I loved. This zone that I get into allowed me to break down new mental and physical boundaries every day. It gave me the satisfaction of knowing I went harder than any other previous day. I never even knew I had this type of mindset until I started crew. Not only did this bring out my new mindset, but it grew each day. Every day I looked forward to pushing myself to my limits—and then climbing down deeper into that well to exceed my prior limits. When I first started crew, my coach encouraged me to go into what he called our “dark place.” This “dark place” was where my mind retreated when I was in extreme pain while rowing. Knowing that it was only my mind holding me back from going any harder, I learned to reverse my thinking so I almost craved the pain to make myself go faster. It wasn’t until recently that I realized how much crew shaped my life and how I’ve changed over the course of it. My intensity, drive, but mainly the nature of my competitiveness has been somehow honed, sharpened and brought to light for me. Now, when I’m supposed to stop, or feel something is trying to hold me back, all I want to do is push harder to break through it. Now, if I didn’t do well on a test, I challenged myself to do better on my next one by doing whatever it took to prepare, and then some extra on top of that. I’ve also started using the idea from crew where the top guys push the bottom guys to spur a competitive collaborative environment in my classes and with friends. While I’m conscious of this internal competitiveness almost all of the time, I don’t feel crazy. I feel motivated and empowered. Even when we raced back on fumes after that grueling workout in the harbor, I couldn’t believe how invigorated and strong I felt once back on land. As we brought in the boats, my teammates and I re-capped the painful details, laughing at the same time. None of us could wait for the next day to break another barrier. Call us crazy. We like it that way. ANALYSIS: When I met with Brooks to brainstorm a topic idea for his Common App essay, he wanted to write about his passion for crew. I kept warning him how sports-themed essays are often dull and cliché. But he kept pushing to write about crew. And it’s a good thing he did! This essay showed me that you can write about anything—even the topics that are often flagged as overdone or potentially boring to read (sports, mission trips, pets, etc.). I still believe you need to be careful of those topics, and that the key is to find something interesting that happened within those topics. Brooks essay is not just about crew, but how those punishing practices re-shaped his DNA. His essay didn’t just say how he learned to work harder or be self-disciplined; his essay showed how he had to be a little crazy. It was critical that Brooks had a clear idea of his main point with this essay before he started writing it so it didn’t fall into the traps of writing about sports. Once he focused on the crazy quality of crew, Brooks was able to brainstorm a real-life example to craft into an anecdote for his introduction. He re-created it by setting the scene (on the open water) with details (five miles home; tunnel vision; blacked out; coxswain yelling…) and dialogue (“Give me a reason to call 911.”). Brooks didn’t tell us how crazy he had to be to row crew. Instead, he just shared one example and we got it immediately. You felt his pain. Then he hit us with the unexpected: He not only endured this craziness, he loved it. Standing by the display window, I wrapped my arms around Sarah’s slippery waist, struggling as I pulled the sheer, black turtleneck over one arm. As I yanked the sweater over her other arm, I heard a snap. One of her fingers dropped to the ground. Although Sarah and the store’s other two mannequins were both relatively new, it has always been a battle to constantly change the mannequins and keep them fashionable. Needless to say, I was not looking forward to the skinny jeans. But, I knew that working at this small boutique in my hometown presented a unique opportunity for me. Adrift, a tiny but hip clothing store for women, gave me a taste of the competitive fashion industry that I love. As a high school junior, I felt lucky for the challenge to create the seasonal displays and transform the mannequins. Even as I wrestled the mannequins in the store window as passersby gaped and laughed, I enjoyed learning about how to style them in eye-catching outfits. During the two years I worked at Adrift, I jumped at every chance to learn more about the latest fashion trends, and also to understand what drove the business of sales and retail. When I was first hired, I mainly worked alongside the manager, but after several months my devotion to the job became evident. I received new responsibilities. No matter how intimidated I felt with these unfamiliar tasks, I always tried to dive in with enthusiasm and confidence. To my surprise, I loved even the most arduous roles. The folding and steaming of clothes, the reorganization of the store, and even the hours of inventory, taught me more about the industry. My dedication to the menial tasks paid off. Last July the owner invited me to the Los Angeles Market to help merchandise the store. We spent almost that entire day walking around to all the different designers’ show rooms and previewing their collections. I felt so fortunate to participate in the buying process, and that my opinion was valued. The owner of the store also allowed me to explore a new way of marketing by starting and managing the Adrift Facebook page. Facebook was something the owner did not know much about, and that was where my age gave me an advantage. With the Facebook page, I was able to reach out to all different age groups and market our small store. As summer ends and fall begins my ongoing battle with the mannequins continues—it’s off with the bikinis and back on with the sweaters and jeans. I have learned to laugh with those people who walk past me on the sidewalk and stare as I wrestle with the mannequins. My increased responsibilities have only increased my creativity, my business sense, and my love of fashion. I believe that all my skills that I have learned at Adrift boutique will prove beneficial to a hopefully life long career in the fashion industry. ANALYSIS: Dylan’s essay is an example of how jobs can make great college app essay topics. Writing about a job almost always reveals a student who is industrious and hardworking right off the bat. What college wouldn’t love those qualities? Also, the nature of most first jobs students take in their teens are humble by nature, and the learning curve is big (and sometimes entertaining) as well. My favorite part of Dylan’s essay is her sense of humor. She does a terrific job of setting the scene by describing herself in the window so we can almost visualize her changing the awkward mannequin as passersby gawked at her. I don’t know if she meant to do this, but withholding some of the details—that Sarah wasn’t a real person—gave her introduction a suspenseful quality. Dylan didn’t set out to write a funny essay, but this description can’t help but make us laugh. There’s something powerful about showing yourself in a vulnerable moment. It makes you come across as very likable, in my opinion. She starts by describing one challenging (and amusing) moment during her job, and then goes on to expand about the nature of her job and what she learned. One point of her essay was to show that her job had its unique demands, and at times was taxing, but that she realized how much she had to learn by sticking with it. As my mom backs out of our driveway, I glance at the back seats to make sure my basketball gear is there, along with my schoolbooks, phone charger, and beat-up copy of Catch-22. We slowly wind through my neighborhood and over about a half dozen speed bumps, then pull onto the highway heading south with the other Sunday traffic. I sit back and watch the familiar landmarks—the large Denny’s sign with the missing “N,” the short stretch of undeveloped land, the Shell billboard that meant we were almost there—flash past my window. I’ve made this 20-mile trip between my parent’s homes for the last decade, four times a week, ever since they divorced when I was seven. I must have taken it more than a thousand times. Sometimes I dreaded getting into that car, and resented my parents for putting my older sister and me through the circular logic that moving us back and forth will make our lives normal because we see each parent often, but moving back and forth isn’t normal, unless they make it normal, which isn’t normal. Now I know it makes sense because normal isn’t ideal, normal is the unexpected and the crazy and the unforgiving. I now realize that those rides were the consistency amid the madness. Looking out the window and down to the lane reflectors I think…about how on Friday’s basketball game my jump shot was off because I was floating to the left, about how I’m excited to see my dog and cat, about how upset I am because of Yossarian’s predicament, about how I’ll miss my dad, about how veterinary medicine is fascinating, about how I needed to study for my chemistry test, about how I will work harder to get into my dream school, and about how I’m glad that I get to take a nice nap before I go to mom’s. I even remember the first time years ago when I noticed the smudge on the rear driver’s side window, which was shaped into a leaping dancer—a dancer in white. I would watch her move through the trees in El Cajon Valley, bob my head up and down to help her jump over hillside terraces of Spring Valley, and keep her from crashing into the Westfield mall sign two miles from my mom’s home. It was those hours I spent thinking silently to myself when I learned more about who I am, where I envision myself going, and what my role is in this world. Sitting in the front seat, I’d take a moment to look back to see that same dancer in white, however faceless, nameless, and abstract, gave me a sense of comfort. That even though I wasn’t really ‘home,’ I still was, because home isn’t simply where you rest your head, but also where you have the security to dream inside of it. ANALYSIS: Once again, an essay like this proves that you can pick almost anything to write about as long as you give it a focus. In this case, Gabrielle picked a simple stretch of roadway between her parent’s homes. She described the weekly routine and drive with vivid, descriptive details, so you felt as though you were in the car staring out the same window. But she used the trip as a metaphor for a meaningful time in her life, when she had lots of downtime to reflect on her life, her feelings and dreams. Even though it shares the pain of her parent’s divorce in an understated way, that’s always in the background—and we can tell it has shaped her. If she never had the time to daydream and reflect on her day, who knows how she would have been different somehow, or those emotions would have played out somewhere else. Nothing really happens in this essay, but it still manages to have momentum and hold our interest. I love how she personifies a little smudge on the window into a dancer, another metaphor for her own journey. In the end, Gabrielle explored the idea of home, and defined it more as a journey than a destination—whether riding in a car for a commute between houses or a lifelong adventure. I believe Gabrielle didn’t set out to write a “deep” essay filled with metaphors and heavy insights, but by describing a simple routine and then reflecting upon what it meant to her, she revealed herself as an observant, reflective and wise young woman. I was in fifth grade eating breakfast with my family when the floor of my home gave way under our feet. We barely escaped from the house before it buckled into two pieces, and ran to safety before the entire hillside gave way. Our home was destroyed, and we narrowly escaped with our lives. Six years ago, my family was caught in this terrifying landslide when my house and a dozen others slid down the side of a canyon in Laguna Beach. Within less than 10 minutes, my life literally fell out from under me. For the next five years, my family moved over a dozen times, often living out of boxes with friends and relatives. Besides my clothes and basic necessities, the only thing I hauled from house to house was my collection of skateboards. Six months after the landslide, the city of Laguna Beach relocated us to a recycled trailer on a parking lot at the end of town so my parents could save money to rebuild our home. I see it now as an extremely generous gesture but at the time it was difficult. Living in this dilapidated, thin-walled trailer was definitely not the life I had envisioned. My backyard was an enormous parking lot. As a lifelong skateboarder, however, that flat expanse of asphalt helped me get through the hardest years of my life. You see, I’m a skater from a hillside neighborhood and had never experienced such space and opportunity. I took advantage of the situation and made this neglected, dirty parking lot into a skateboarding oasis with ramps and rails that my friends donated. We would all gather together after school as a release from the pressures of life for a while, practicing trick after trick, working to fine-tune each maneuver. Contests were created, videos shot, and movies made. For the first time in my life, I had a flat area where my friends and I could hang out. Even though we didn’t talk much about the landslide, these friendships were both a distraction and softened the unpleasant living situation. Also, balancing sports and loads of homework, I turned to what I thought of as my new backyard skate park at night to escape from reality each day. The sense of riding back and forth on a cold night helped me relax and persevere through my studies and life in general. Numerous years passed in that cramped rickety, old trailer and life wore on dealing with everything from highway noise reverberating right outside our door to the constant rodent problem. When my family’s new, hillside home finally came to completion at Christmas last year, I was more than ready to move. The only thing I would miss from my five-year ordeal was my beloved “skate park.” After moving into our permanent home, the crazy life I endured since fifth grade was now over and even though I could not bring the skate ramps themselves, I was able to bring plenty of memories. One of the most important lessons I learned through all this is that I have the ability to find positive opportunities even in the grimmest circumstances. If I could find friendship, support and fun in a parking lot, I know I can find the upside to almost any situation. Because Luc’s description of his experience showed us how bad things were and then the steps he took to improve them, he never had to spend a lot of time explaining what he learned. He only needed a couple sentences at the very end to share his lessons. A lot of students who grow up in Southern California want to write about their passions for sports, such as surfing and skate boarding. I usually steer them away from these topics, since they aren’t very interesting to read. Luc’s essay is a huge exception!